Our product range includes a wide range of wide belt sander and mirror finishing machine. The grinding and brushing machines of the new AX series represent the evolution of the previous AT series. The new AXs extend the range of thicknesses (up to 15mm), the installed power (now up to 90kW), the speed of work and they introduce an advanced electronic management of the machine and a new touch screen graphical user interface. In addition to the modular concept, one of the hallmarks of the new AX is represented by their monolithic structure designed specifically for heavy machining and the ability to fully extract with a simple movement the counter-pressure roller (aka billy-roll). The new AX maintain the same footprint and many parts of the previous generation, making the transition to the new model very simple and cost effective. All machines are available for machining coil and sheets, as well as dry or wet process. Imeas SuperMirror machines have been engineered to achieve the highest grade of polishing: a perfectly reflective, non directional surface. Our exclusive design with vertical spindles combines several movements together to smooth the processed surface and remove every imperfection: the final result is a roughness profile with Ra values as low as 0,001μm and reflexction of more than 600 °Gloss! 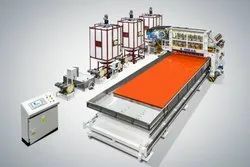 PMC, a conveyor-type model engineered for Service Centers and very long plates, over 9.000mm.